Rocksmith Review (2014) - Read before buying. JamPlay has been around since 2007. As is the case with any industry, competitors will come and go. We're not arrogant or nieve. Some of our competitors are pretty damn awesome. Many of them have certain features that are even better than what JamPlay has to offer. But as a whole, we still strongly feel that our hard work has paid off in helping us to achieve our goal of providing the quickest, most convenient & affordable way to improve your guitar playing. Read below for our Rocksmith 2014 review. Rocksmith 2014 Rating: 2.5 out of 5 based on 1 reviews. Our goal is for this review to be short and sweet. This won't be a full in-depth review of every aspect of the software, explaining and demonstrating every feature set. Instead, we'll just give our high-level feedback on its usefulness in the guitar education space. Fun - One of the toughest obstacles for any type of education is level of fun. If you aren't having fun then you'll experience diminishing returns and eventually give up. 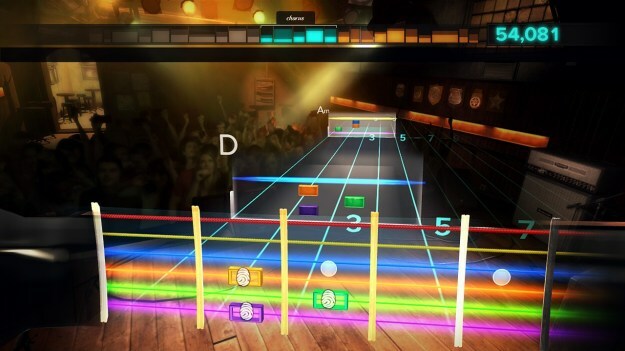 The gamification of learning seems to be one of the primary goals of Rocksmith. Simple feedback and scoring systems add a "fun" element to it above and beyond most other learning mediums (books, DVDs, etc). If you're having fun, you'll continue to play the game. While playing the game, a guitar is in your hands...and every minute with a guitar in your hands is definitely a good thing. Good Value - Assuming you already have a guitar and the adapter cable, game costs $50-$60. It's very easy to put dozens if not hundreds of hours into the game. When you price this out as entertainment or education on a dollar per hour level, you're not paying much. Definitely a lot of value here! Ideal Platforms - There's something to be said for being able to play this on your Wii, Mac, PS3, PS4, Xbox 360, or Xbox One. It's very cool to sit in your living room with instruction coming through your 7.1 surround sound system, with video from your HDTV. Compared to being at a computer or smaller laptop / iPad screen, being able to utilize your main entertainment system is very immersive. Develop Bad Habits - While Rocksmith does provide some video instruction and basic foundations, we found that overall, there are a lot of gaps in the teaching. A majority of the focus and direction tends to be on hopping into songs and just going for it. This can not only be very frustrating (see below), but will also leave you lacking a lot of mandatory knowledge. Sure you can get in there and learn a few notes of a song, but without knowing the proper way to hold your guitar, fret your guitar, position fingers, etc...you're going to be developing very bad habits. Awkward Method of Teaching - This could just be because we are used to video instruction and tablature. However, we found that the actual way that you're taught is very, very awkward. Notes fly at you just like in games such as Guitar Hero. Except this time, instead of being required to mash one of 4 huge plastic buttons, you're having to accurately fret one of the 144 notes on the fretboard, oftentimes having to play more than one at a time. We know our way around the fretboard pretty well, but found it very awkward to try to get our hands to cooprate as the notes flew towards us. If this is your first time ever touching a guitar, you may be able to pick it up okay. But for those of you with some experience playing, watching videos, and/or reading tablature...you may be in for a rough ride. Frustrating - Along the lines of the above point, we often found ourselves to be very frustrated. A lot more time was spent trying to figure out what note was to be played where (it's a weird combination of numbers and string colors), instead of actually getting our finger to the appropriate fret. Again, this could be a result of our past education and familiarity with video and tabs. But the Rocksmith format of notes flying at you was overwhelming for us. Too Much, Too Fast - JamPlay's video lessons typically teach you one phrase at a time. Slowly but surely, you're able to put together these indivdiual phrases and play a complete song. Rocksmith throws the entire song at you at once. While it is very cool to hear the entire song and go through it, we found it to move a little bit too quickly. In certain game modes, you can screw up a phrase and they'll have you repeat it at a slower pace. Maybe we're crazy, but we didn't feel much of a slowdown. It may have gone from 140 bpm to 130 bpm, but we were more in need of a 70 bpm practice run. We really wish there was a way to slow this down more...but couldn't find this feature. Upsells of Content - While the price of the software itself is solid, they upsell the crap out of you. A few dozen songs are included for free, but if there's others you want to learn, then you'll find yourself paying an additional $5-$10 per pack (usually 2-5) of songs. With sites like JamPlay you get access to everything for one low monthly price. No upsells. There's something very comforting about that. Anything that gets guitars into peoples' hands is a good thing. Rocksmith has a lot of curb appeal with the Fastest Way to Learn Guitar pitch and Learn Guitar in 60 Days campaign. Sure, if you are using the software for a hour every single day for 60 days, you're going to be a lot better than when you first started. Depending on the person and your ability to adapt to their teaching method, you may even be able to play a few songs. However, we believe you're going to lack basic mandatory, fundamental knowledge. This will lead you towards developing bad habits, making it difficult to progress as a player and learn other songs. This software is great for getting someone interested in the guitar. The gamification makes it fun and will keep the guitar in your hands - BIG bonus. Is this an effective, proper way for someone to develop long term skills and learn guitar? In our opinion, absolutely not.